Being the son of a plumber, I’ve witnessed many inventive ways to stay warm while working on cold steel in frigid winters atop a 700 foot tall powerhouse. From modern acetylene torches to alcohol stoves, plumbers get creative when it comes to heat sources. Before the time of pressurized gasoline blow torches, alcohol was used as fuel for melting lead and soldering. However, at some point in history, before the modern thermos came about, a smart plumber poured cold coffee from his makeshift milk bottle thermos and slurped cold soup from his lunch pail. This was his ah-ha moment! Hummmm, just add some alcohol to a container stuffed with cotton rags and set it on fire! And the plumber’s stove was born. At least that’s the story I heard told. I built a pint-sized plumber’s stove 7 or 8 years ago. It’s a lightweight, self-contained, and portable stove for backpackers (ultra-lighters excluded) and campers. I last used it 5 years ago. Upon re-opening, the denatured alcohol lit up with no problem. I didn’t like the fact that I had to loosen the hose clamp and slide the pot holder down to remove the paint lid. A small annoyance really. 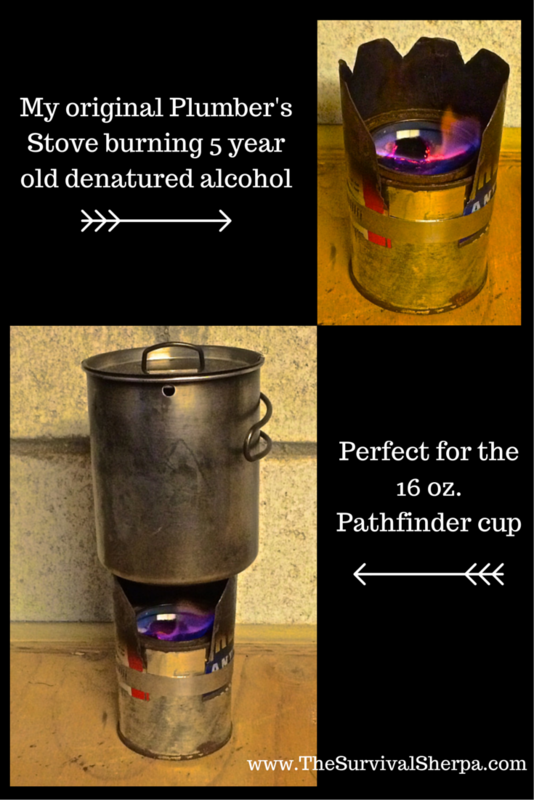 Joshua Shuttlesworth, a fellow self-reliance blogger and Pathfinder brother, happened to post his brilliant version… a larger DIY Hobo Stove, as he dubbed it. He used a gallon paint can and a #3 size can (45 ounces). He has a fancy can opener that removes the can lid in a way that you can seal the can with the lid after it’s been removed. Wish I had one… but I don’t. But I did have an empty quart paint can nesting in a gallon paint can I’d planned to use for another project. This larger version would feed and heat a whole crew of hungry plumbers! Check out our video at the bottom of this post to see the Plumber’s Stove on steroids in action. Remove the cardboard tube from the toilet paper roll. Grip the edge and pull the tube out of the center. Smashing the roll a couple of times seems to loosen the tube enough to slide it out. DRG buys the larger rolls of TP which wouldn’t fit in the quart can. I removed excess TP from the roll by sliding my finger between the sheets about a 1/2 inch from the outside and ripped it free of the roll. Squeeze what’s left of the roll together and stuff it into the quart can. Place the excess in a ziplock bag and toss it into your camping gear for the call of nature. Pour the alcohol of your choosing in the TP stuffed quart can. My small plumber’s stove contained denatured alcohol over cotton and burns much cleaner than the 91% isopropyl. WARNING: Do NOT use gasoline or other highly flammable petroleum-based fuels/accelerates! You’ll explode into flames if you do so. The quart can held a little less than one 32 ounce bottle of alcohol. Allow the TP to absorb the fuel until completely saturated. 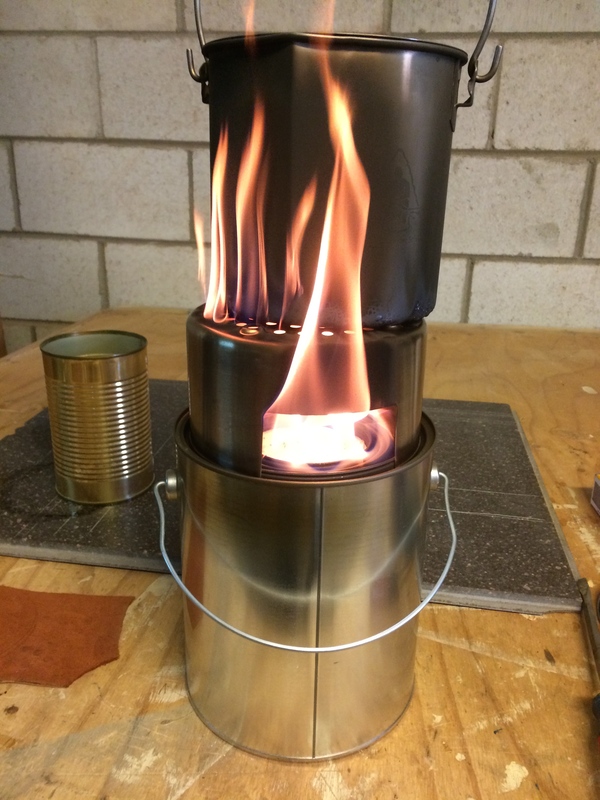 On Joshua’s Hobo Stove, his #3 tin can was tall enough for the flames to breathe oxygen. On my shorter quart fuel can, the flame would not stay lit inside the gallon can for more than a couple of minutes. To remedy my vertically challenged container, I elevated it a few inches by sitting it on a metal bowl I’d bought at a yard sale for a quarter. A large, empty tuna can would probably work too. As an added plus, you’ve got another useable container inside your stove. Light the fuel can. Ferro rod sparks will ignite the fumes inside the can. If using a match or lighter, be careful to keep your hand to the side of the stove opening while lighting. If you plan to use a Pathfinder Nesting Stove to hold cook pots, now is the time to place it on top of the gallon paint can. The flames from the fuel can will reach a foot or more in height. A common man stove top can be made by adding coat hanger wire across the opening for pots to rest. Or cut a piece of sheet metal 4 inches wide with 1/2 inch notches on the top edge and securing it to the gallon can with a few hose clamps coupled together. You would lose the can’s bail handle but you’d have a functional stove top. The picture of my small plumber’s stove will give you an idea of how to make your own cook top. As a test, I boiled about 62 ounces of water in my Pathfinder Bush Pot in 17 minutes inside my shop. Note: Use the plumber’s stove only in a properly ventilated area to avoid carbon monoxide poisoning. I also tested the boil time with the same amount of water in my backyard bushcraft area with the same results. I thought lifting the Bush Pot about a half-inch over the stove top via my outdoor kitchen tripod would decrease the boil time. Still took about 17 minutes inside and outside. 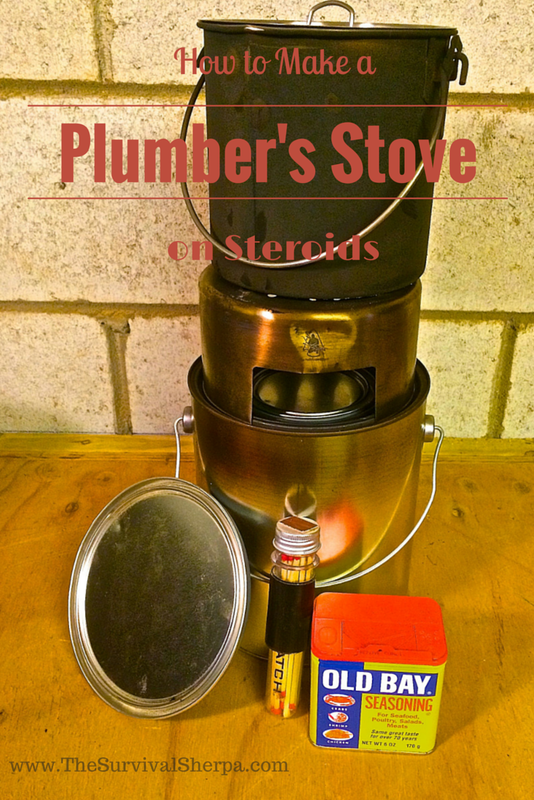 Thanks again to Joshua for his tutorial that spurred me to make the Plumber’s Stove on Steroids! Overall, I’m very pleased. This stove would be useful as an alternative heating/cooking option when car camping, at deer camp, as a car emergency kit, or added to your emergency preparedness stocks at home. Great idea, BK! That’s a great option for lightweight stove gear, brother! Have you made one of these “plumber’s stoves” out of recycled paint cans or do you make them out of new cans? if so, how do you recommend removing the paint? Do you think the paint cans would make a good “bush pot”? Good to hear from you Caroline! Hope all is well. The small plumber’s stove was a used paint can. I remember cleaning it out by a little scrubbing. I suppose you could burn it out in a campfire too. In a pinch, I’d use the one gallon bucket as a bush pot for sure. Not on a regular basis though. Not sure what the metal would do on the seams. A buddy of mine made a rocket stove from a plastic 5 gallon bucket and filled around the pipe with concrete… not to lightweight but it works. I like the idea of using vermiculite and clay. That may be my next stove project. Thanks for sharing the link. Have you seen this 5 gallon metal pail rocket stove? It would be another alternative if you didn’t have a source of alcohol. Where can you find denatured alcohol? Most places tried sending me to the alcohol aisle. And gave me a blank look when I said you couldn’t drink it. a little heads-up re: alcohol: check local prices and availability. “Denatured Alcohol” is usually ethanol with just enough methanol added to make it poisonous (and non-taxable as hooch). It is getting harder to find as more and more paint/varnish goes to water-based.media. Isopropyl (“rubbing alcohol”) is propanol (and water). You can find it cheaply on every pharmacy aisle, and it works just as well (for me, anyway, YMMV). Check the label. You’ll usually find bottles marked “50%”, “75%” and “91%”. Go with 91% – why pay for water? Usually just a couple pennies difference in price. 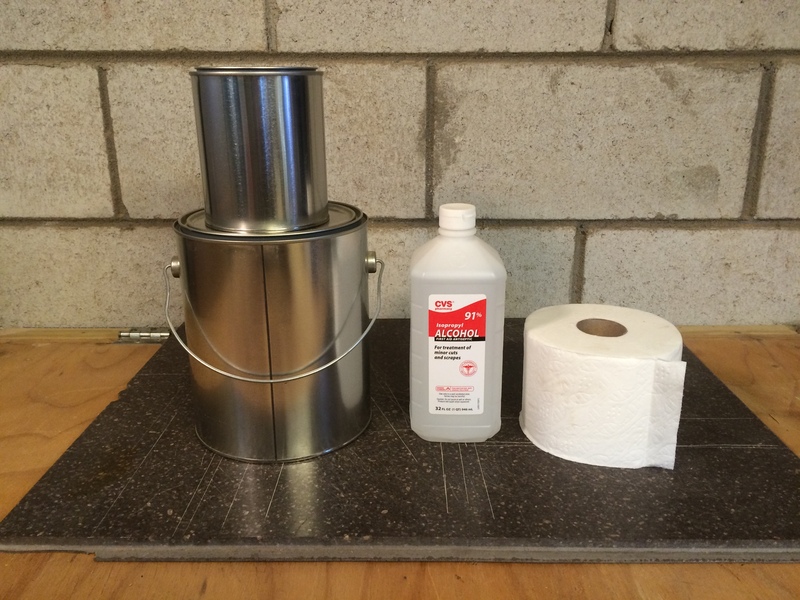 Great stuff – stove fuel, first aid disinfectant, non-stinky charcoal lighter. I like to store/carry mine in stainless steel ‘water’ bottles. (5 years and no gasket deterioration so far). Stick with one color (like red) for non-drinkable fuel. Maybe even some sort of tactile covering (some ranger bands, or something) just so you don’t grab the wrong bottle in the dark. Good tip, Wyzyrd! Thanks for sharing. That’s the easiest alcohol stove I’ve ever seen! Thanks for sharing that with us, Caroline! BTW, what email did you send that too? One of my accounts is messed up and can’t receive mail. I send to Todd Walker . Is that one still good? Got it. Awesome job,girl! 5 minute boil time right? Great stuff! I wonder how many years pre-made alcohol filled stoves can sit? Thanks for stopping by and commenting! With a good seal on the container, I’d think many years. That small plumbers stove I showed wasn’t used for several years and lit right up. Many thanks for reading and watching the stuff, Sarah! Let us know how it turns out. So creative of you, thank you for posting this. Glad to. Hope it helps. Thanks for letting me know.